Killer Characters: The #Budweiser #Clydesdale #Beerwagon was here! #Bookgiveaway! The #Budweiser #Clydesdale #Beerwagon was here! #Bookgiveaway! Hi, Savannah here. The Budweiser Clydesdales were here on Central Avenue in St. Petersburg! Fifty years ago on January 1st, 1968, Great Bay Distributors started selling beer in Pinellas County. Today, the 2nd and 3rd generation of founder Claude Focardi continue to operate Great Bay as a local family owned business. 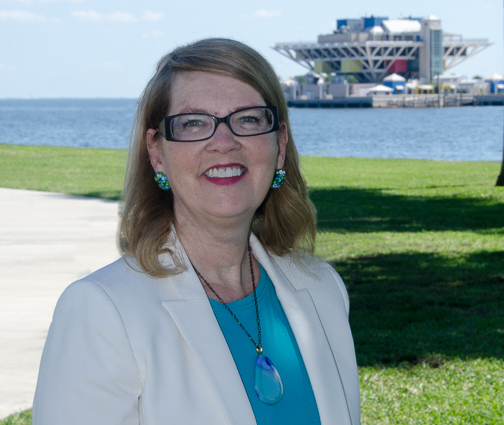 With 20 trucks, 30 Great Bay "family members," and a small warehouse in St. Pete to over 250 vehicles, 360 "family members," and two warehouses. 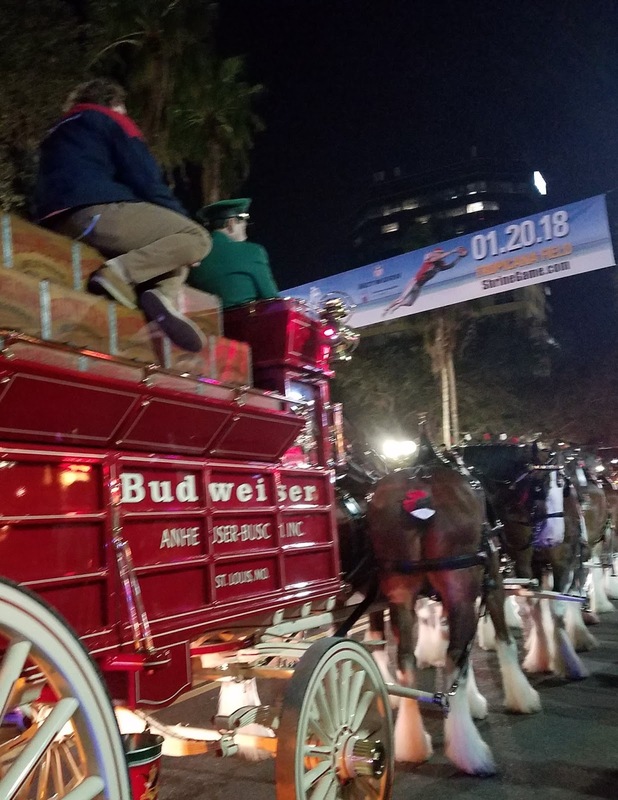 The celebration featured the famous Budweiser Clydesdales pulling a vintage beer wagon with a Dalmatian riding shotgun. The event started at 7 PM at Corrigan's Irish Pub and moved down to the popular bars and eateries on Central Avenue. Then they they turned down 1st Avenue South for a final stop at the Park & Rec. The event lasted until 9 PM, but everyone was completely captivated by the charm of those gentle giants. What a wonderful way to celebrate. Cheers to 50 years of service from the family at Great Bay Distributors and good luck for 50 more! There's a #BOOKGIVEAWAY! Leave a comment and your email address in the form of name(AT)server(DOT)com to avoid the SPAM bots. 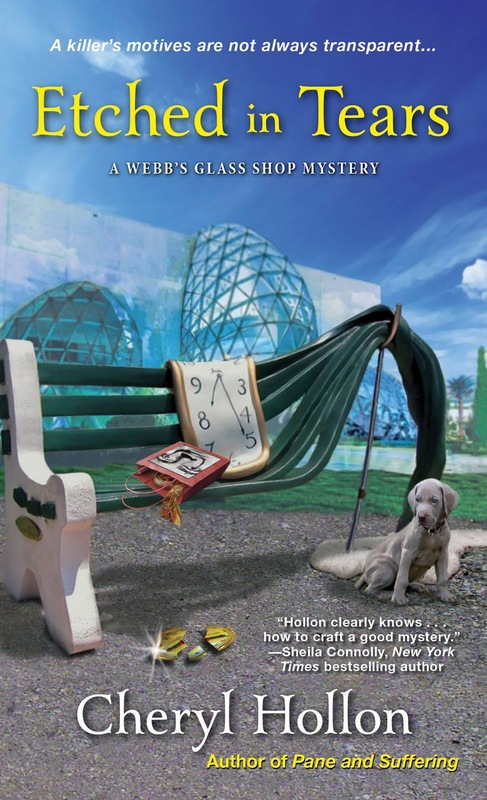 Do this by midnight on January 25 for the chance to win your choice of a signed copy of any book in the Webb's Glass Shop Mystery Series, Pane and Suffering, Shards of Murder, Cracked to Death, or Etched in Tears. This giveaway is open to U.S. and Canadian residents only. Winner will be notified within 48 hours after giveaway closes. No I've never seen the horses. I would love to win a copy of "Etched In Tears",thanks for sharing! Veronica, vboudreau57@gmail.com. Well worth it to see them if you get the chance. Good luck in the giveaway! The Clydesdale horses are a woderful experience in person. So gentle. So BIG! Good luck in the drawing. Although I've never seen the Budweiser Clydesdales in person, seeing them is on our bucket list. Now that we are retired, I'm hoping to scratch that off our list sooner than later. We have friends that live in the St. Louis area where they appear frequently. However, work schedules of theirs or ours have prevented us from attending one of the event so far. Also, they are kept full time in Warm Springs Ranch near Boonville, Missouri which is about 150 miles west of St. Louis. So, maybe a short day trip with friends the next trip us! 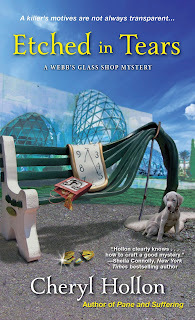 Thank you for the amazing chance to win a signed copy of one of the Webb's Glass Shop Mystery Series books! I'd very much love to read "Etched in Tears". They used to keep a stable in Busch Gardens in Tampa. Sadly - no more. Good luck in the giveaway! I saw the Clydesdale horses at the Texas State Fair in Dallas years ago. They were lovely. My email is beturner0418@icloud.com. Thrills me every time. Good luck in the giveaway! Because this was an anniversary celebration that was barely publicized -- we could walk right up to the wagon. Amazing. Good luck in the giveaway! Wow! Lucky you. Good luck in the giveaway! I have never seen the Clydesdale horses in person. They are beautiful. Pictures and videos don't do justice to these gentle giants. Good luck in the giveaway! We've seen them more than once, but yes - very impressive. Good luck in the giveaway! There is a Anheuser-Busch plant in my state, New Hampshire. I've been on tours and when my son was little, my friend and I would bring our kids to see the Clydesdale and the Dalmatian just for fun. I believe the plant has a Clydesdale Day every year to get photos with them. I don't know if you can still visit them like I did years ago. We had similar access when the kids were small at the Busch Gardens plant. Good luck in the giveaway! I've never seen the Clydesdales---but I'd sure like to see them. I hope you get a chance -- it's one of those bucket list things. Good luck in the giveaway! So happy you like my little glass world. Good luck in the giveaway! I enjoy writing this series. The vibrant art and small business community here in St. Petersburg inspires me. Good luck in the giveaway! 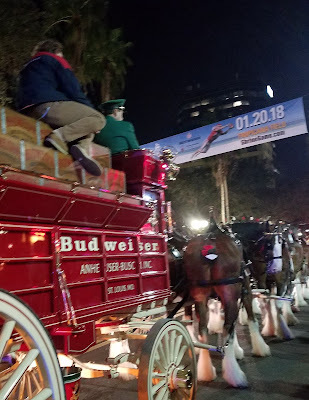 I never seen the Budweiser Clydesdales in person - love the ads. Well worth it if you get the chance. Good luck in the giveaway! Their personalities are as big as they are. Good luck in the giveaway! You can tell they LOVE being hitched and working. Good luck in the giveaway! I have seen the Budweiser Clydesdales in a parade years ago. They are beautiful horses. I've also been to St. Louis where they have a brewery and raise the horses. They are beautiful horses. I like that they are beautiful, but don't seem to know it. Good luck in the giveaway! I saw the Clydesdales in St. Louis when I was little. They are beautiful. Thanks for the book giveaway. I've read your first three books in the series but haven't read "Etched in Tears" yet. I started reading this series since I dabble in both traditional stain glass and glass fusing and kept reading because I enjoy them tremendously. Thanks for reading the series. I also like traditional stained glass and fusing the most. Good luck in the giveaway! Oh, how lucky! I got to stand within a few feet of them. The local police simply detoured traffic around them so it was a street event. Good luck in the giveaway! I don't watch the Super Bow;, but I usually manage to catch the Budweiser ad at some point. They are usually terrific. I don't watch the Super Bowl either -- I would rather read. Try to skulk out the new Budweiser ad in the few days before or after. I can usually find it on-line. Good luck in the giveaway! I'd like to see the Clydesdales in person one day. It is well worth the effort to see them. Can't quite get their real impact from the ads. Good luck in the giveaway! For such large horses, they move with delicate precision. It's awesome! Good luck in the giveaway! Oh, I am so jealous. They used to have a permanent exhibit at the Tampa Busch Gardens Park, but they've been gone a long time. Good luck in the giveaway! Well worth the trouble to find them. Gorgeous! Good luck in the giveaway! I've only seen Clydesdales on tv but they look beautiful. Thanks for the opportunity. It's a wonderful experience to see them in person. Good luck in the giveaway! Oh my goodness! What a great adventure for your daughter -- discipline and confidence in one sport. Good Luck in the giveaway! Oh I love the Clydesdale horses. They're so majestic! I've never seen them in person, but would love to. I enjoy them every time. Every. Single. Time. Good luck in the giveaway! No, I have never seen THE Clydesdales in person, although I saw a Clydesdale at the State Fair and wow they are big! Thanks so much! I haven't seen them but would love to. I have seen them several times. They are beautiful horses and very big.